Trying to get your B2B (business to business) company to the top of Google in organic (unpaid) search? That can feel like a daunting task, but it’s absolutely crucial if you want your business to grow. Fortunately, you can hire a B2B SEO agency to do this for you! But even choosing the right B2B SEO agency can seem overwhelming. We’re here to help you understand how it works and get your company to the top of Google. If you’re looking for an excellent B2B SEO agency, try our free personalized SEO strategy review. There’s no commitment at all. If you decide it’s a good fit, great! We’d love to work with you! If not, no worries. Before we dive into how to get your company to show up at the top of Google, let’s look at how B2B SEO is different from B2C. While there are a lot of similarities in B2B and B2C (business to consumer) SEO strategies, there are some key differences to keep in mind. The main difference is the goal. The decision process in B2B is usually much longer than with B2C. This is because the cost of the product or service is typically higher than in B2B. In B2C SEO, the primary goal of the website is to get the consumer to land on the website and purchase a good or service at that moment. When a business is in the research phase, they aren’t ready to purchase yet. Instead, they’re looking to find the best possible company to work with for the service they need. So, when someone at a particular business is looking for a service you provide, you want to not only show up for them but also get them to stay in contact with you. This could be signing up for a newsletter, following your podcast, or filling out a lead form so the sales team can contact the searcher. As a result, a good B2B SEO campaign will focus on providing valuable content that will cause the searcher to trust your business as an expert. An experienced B2B SEO company will do this for you through compelling content that the searcher deems valuable. Compelling content has to be USEFUL to the reader. If it isn’t, your business won’t seem like an authority in its field and you will lose potential clients. Some good examples would be in-depth newsletters, youtube videos, or blog posts that explain to your audience how they can improve and how the service that they’re looking for, whether they use your company or not, will benefit their business. 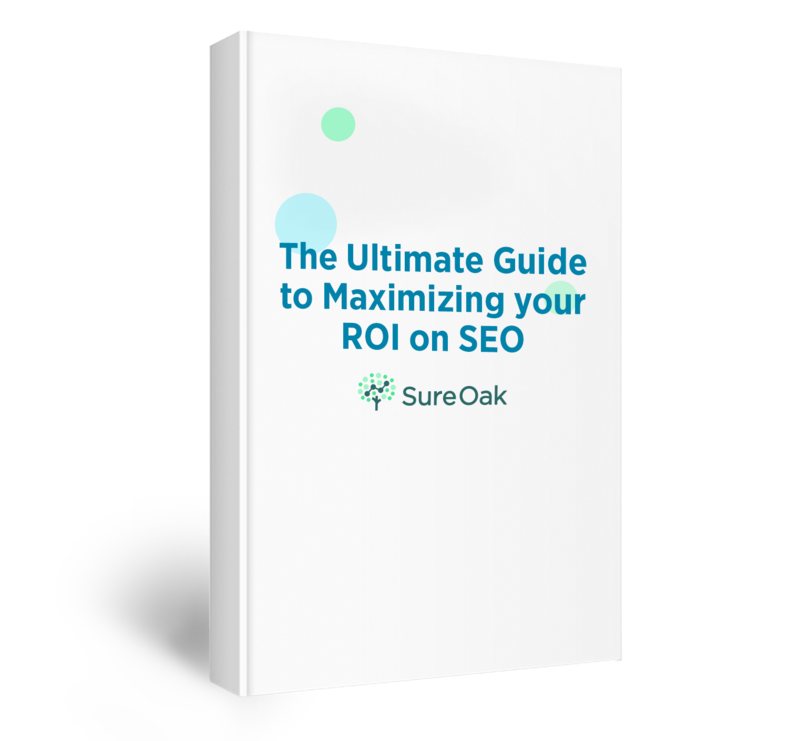 As an example, we at Sure Oak have an SEO podcast where we teach consumers and businesses the ins and outs of SEO. We go in-depth into the strategies that work for B2B SEO and B2C as well. Does the B2B SEO agency do this? If so, that’s a great indicator that they’re an expert in B2B SEO and worthy of your trust. Showing up when a business is ready to purchase your service is also incredibly important. Wherever someone is in the buying process, you want your business to be there. During the research phase, a company will most likely be looking at different businesses that are authorities in their field. Even if your business has the best and most compelling content, they still might be searching around. They could be getting great content elsewhere as well or maybe they haven’t come across your business during their research. There’s no way to protect against that. You also want to get your business to show up when they’re in the “ready to purchase” phase. That means getting your business to the top of Google. Why is it so important to have your B2B website show up in the number 1 spot on Google? Getting your B2B company to the top of Google is huge and will give your business a gigantic advantage over your competitors. The top organic position on Google has a CTR (click through rate) of 29.76%, according to a study by Advanced Web Ranking. Conversely, the number 11 spot (the top spot on page 2) has a CTR of about 1%. So getting your website to show up on page 1 is critical, but it’s just as critical to get the top spot on the SERP (search engine results page). That leaves you with over 70% of the SERP to tackle, in addition to the top spot. Keyword research may not be the sexiest part of SEO, but it’s very important. Not only do you want your website to show up for the most relevant searches, but more importantly, you need it to show up for the ones most likely to buy. Top keywords tend to involve words like “best”, “top”, or “reviews”. Those keywords, when included with your service, will have a much higher buyer-intent. These are the keywords to focus on. Your website needs to show up for these keywords as much as possible. This starts by optimizing your website for the services you provide by adding title tags, meta descriptions, and H1 tags to each page of your website. Also, you will want to create in-depth pages on your website that explain the services your business offers. For example, if you have a law firm that specializes in legal services for corporations, you should build a page for each individual service you provide on your website that explains each one in-depth. This is another great way to find a B2B SEO agency. When you’re considering an agency, is it doing these things? Does it have in-depth content that you find useful that makes want to come back for more? While getting your website to the top of Google is fantastic, it’s also incredibly difficult to do. And, quite frankly, even if your website is showing up on page 1, you shouldn’t stop there. How can you do better than the top spot on Google? By showing up multiple times on the SERP. If your website ranks number 1, you should capture almost 30% of the clicks for that keyword search. B2B SEO is about much more than just getting your website to rank, it’s also about positioning your brand. Notice that none of the top five organic search results are websites offering online work management software. Instead, they’re all third-party websites like Capterra. 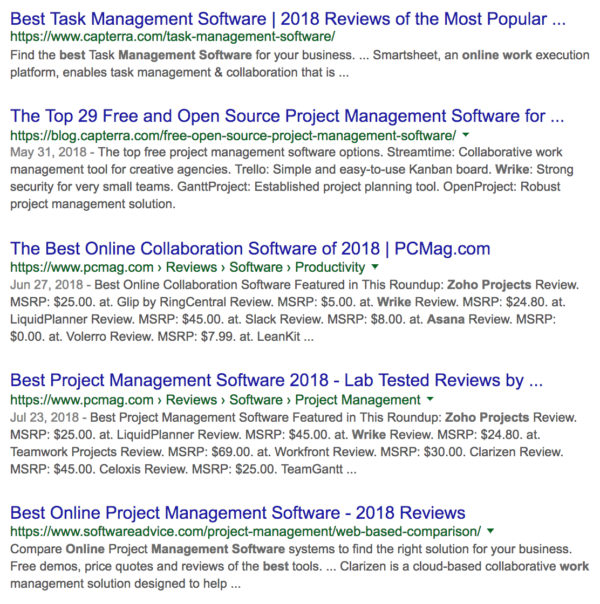 Getting your company on third-party review sites like Capterra, Software Advice, and others will be a huge benefit to increasing your CTR and getting you on page 1. If your website ranks number 1, you should capture almost 30% of the clicks for that keyword search. However, getting it to show up on some of these other third-party sites will help you capture more of the remaining 70%. It also makes it much easier to show up on page 1. Your journey to find a stellar B2B SEO agency is the same as a company looking for the service you provide. According to an Avanade study, 61% of B2B buyers are consulting third-party review sites before contacting a company’s sales’ team. And the more reviews the company has, the more views its profile gets. Would you want to hire a B2B SEO agency that has good reviews? Before doing business with a B2B SEO company, would you look at its reviews on Google and third-party sites? Chances are you would! When looking for a B2B SEO agency, do this same thing. Check out its reviews on Google, social media, and third-party sites. Does it have a good score? When there’s a negative review, does the agency respond and attempt to rectify the problem? Getting your business on page 1 of Google is a major accomplishment and will generate a lot of traffic to your company. However, the battle isn’t over just yet. The next step is getting that traffic to convert into a lead. In other words, when people land on your website, is it optimized to get them to give you their information? A big part of this is having the proper call to action (CTA). Poorly optimized websites will simply ask for a potential client’s information. But people early on in the research phase won’t be ready or willing to give you their information unless you ask them the right way. Websites that have been optimized to convert potential clients into leads will have a CTA that provides value to the potential client. Having a tap-to-call phone number simply isn’t enough. A good CTA is a button that says something like “Get Free Advice” or “Get Your Free Demo”. A good CTA will offer something of value to the prospect at no cost, and then take that person to a form requesting their information. Pricing is huge when looking to hire a B2B SEO agency. While everyone wants to get a good deal and save the company money, hiring the cheapest SEO company will probably cost you more in the long run. Stay away from agencies that ask for a large sum, more than $2,500, up front. Cheap can be expensive. Agencies that charge next to nothing, $500 or less per month, will give you just that. Next to nothing. What SEO Services Are You Getting? In SEO, jumping up in the rankings rarely happens quickly. Instead, they typically take at least a few months before you start to see increases, especially major ones. In the meantime, the agency should be able to lay out for you the exact plan of attack it is going to execute to improve your rankings on a monthly basis. It should also show you work logs if you request them. Are they going to add your company to third-party review sites like the ones mentioned above? Will they manage all reviews for you and respond to 100% of the negative reviews? What will they do for your on-site optimization? Is the agency going to write in-depth, weekly blog posts that draw in businesses in the research phase? These are just a few of the questions a good B2B SEO agency will answer for you. What’s the Process if Something Goes Wrong? No matter how good an agency is, there will be a time when something goes wrong. A good B2B SEO agency will work with a lot of clients and at some point, there will be a misunderstanding, missed deadline or some other issue. It’s inevitable. When that happens, a good agency will talk you through it, resolve the issue and put a process in place to prevent it from happening again. With all that’s been said, we believe we’re the best B2B SEO agency with the best SEO services out there and we want to prove it to you. Click here and we’ll give you a free personalized B2B SEO strategy review that’s tailored specifically to your business. If you like it and decide it’s a good fit, we’d love to do business with you. But there’s no commitment.